Have you ever lost your Windows password and unable to access your computer?Well, you’re not the only one, hundreds of the peoples forgot their password and cannot access the computer which is required to login.The first solution available to access your computer is re-installing the Windows after formatting the previous one, but this is not a recommended method. 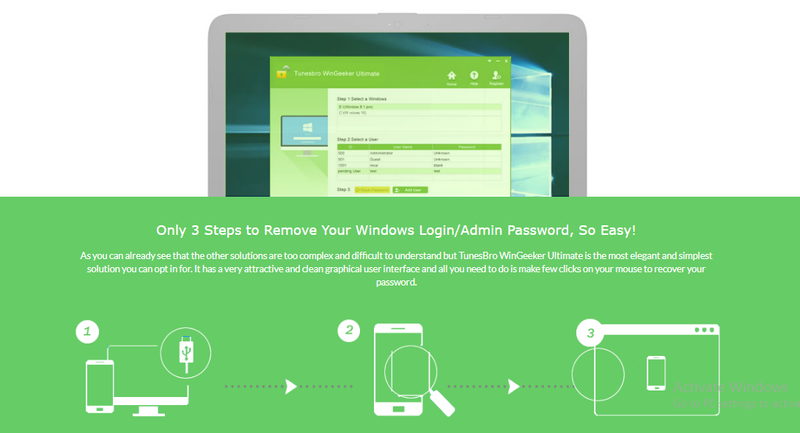 Luckily there is a tool especially build for password recovery which you can use whenever you lost your password.TunesBro WinGeeker is an ultimate tool to reset your Windows Administrator & User Password without reinstalling the windows and without lost any data. 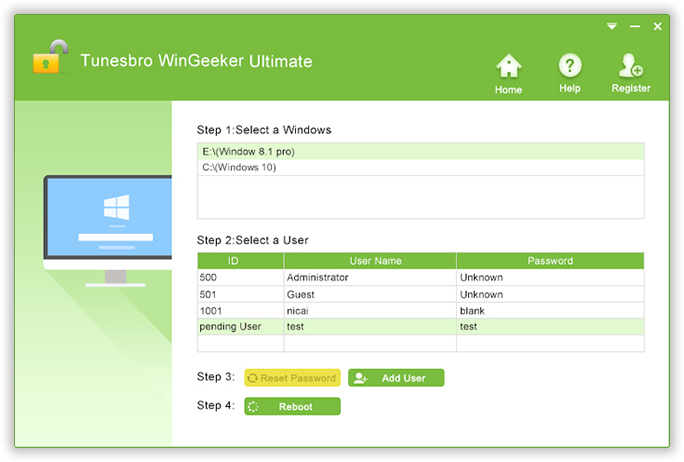 TunesBro WinGeeker Ultimate is a Windows password recovery software that helps you to bypass your password to allow you access to your computer without re-installing the Windows and losing any data. This is a popular Password recovery tool which is using thousands of customers which claims to have 100% recovery rate. There are some other different methods available which are complicated to use, so using TunesBro WinGeeker will help you to access your computer system without knowing the password easily. TunesBro simply creates a USB/DVD Windows password reset disk, this reset disk can be used to bypass the password when you can’t login to the Windows Administrator account. To create a Bootable reset disk with CD or DVD, by burning the ISO image file on your DVD using TunesbBro WinGeeker. Once you have done with the burning of CD/DVD, the reset disk is will be ready and you can use to bypass password next time. Just like you can create a Bootable Windows using a pen drive, you can also create a bootable reset disk using FlashDrive.It supports 60 types of USB models and brands. After creating reset disk successfully, you can unlock any Windows account within minutes in just three steps. WinGeeker comes with some amazing features which make this tool better than other password recovery tool. The first feature of this tool is that it supports 1600+ computer models so it doesn’t matter which computer system are you using this plugin will definitely work and help you to reset the password.It supports all the major brand such as Dell, HP, Asus, Acer, and others. If you’re worried about the compatibility of this tool that it will work with the installed version of your computer operating system or not?Then TunesBro WinGeeker works perfectly with almost every Windows OS like Windows 10, 8.1, 8, 7, Vista, XP, 2000. Windows Server 2012 (R2)/2008 (R2)/2003 (R2), etc. 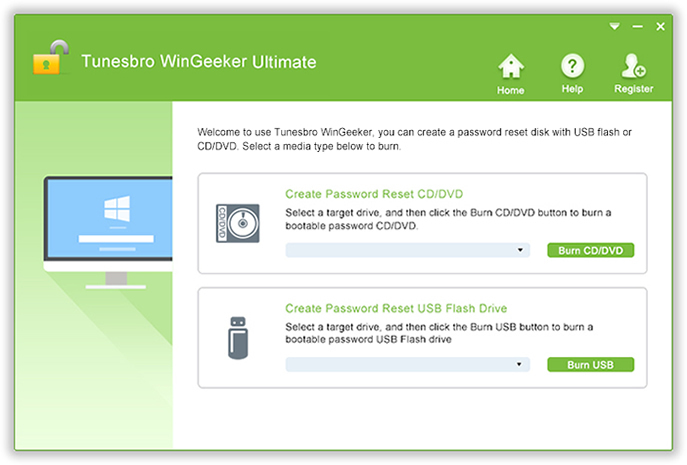 Unlike Any Ordinary tool, TuneBro lets you create reset disk with USB flash drive or CD/DVD.You can create a Windows password reset disk from any USB flash drive which supports up to 60 USB models and brands. All these accounts can be reset by this single tool easily. It supports almost all file systems like FAT16, FAT32, NTFS, NTFS5, etc. and types of hard drives like IDE, SATA, SCSI, etc. So, if you’re wondering how to use this tool, then you need to read this complete step by step tutorial to know how to bypass Windows Bypass using TunesBro WinGeeker. The first step is to install this tool on some one’s computer as you can’t login to your’s computer.Almost any computer system can be used to proceed the next step. Once you successfully installed the TunesBro WinGeeker on someone’s computer, the next thing you have to do is create a reset disk with USB or CD/DVD. To create a reset disk, insert a USB Flash (Recommended) or DVD so the software can burn the files to your disk and make it usable to bypass the password. Now choose the device name from the drop-down menu and click on the option that says “Burn USB”. Wait for some minutes until the files are burned successfully and then eject it from the computer. After creating the reset disk, now insert the bootable disk in your computer and boot your computer system by Pressing F2, F8, Esc, Del key or any other key from the keyboard. Every computer has its own boot menu button which you can see on the display while opening it.You can also open the BIOS menu on your computer if you can’t see the boot menu button. Now you can see a window, select the target locked account, click “Reset Password” and then “Reboot” button. Once all things are done properly the system would restart but this time, it will open the account without asking for any password.